The Engines Off! Colorado campaign provides Colorado communities, businesses, and residents with information about how to protect Colorado's air quality while saving fuel and money. This online resource addresses the specific challenges, regulations, and needs for various vehicle types in our state. 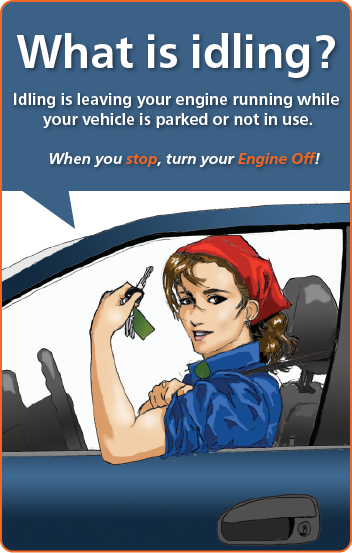 Here you will find targeted messages for these drivers, including facts on the environmental, public health, and financial impacts of idling vehicles, driving tips to avoid idling, plus strategies and tools to start your own engine idling reduction programs at the local level. Click on your vehicle type below to learn more about how you can contribute to cleaner air in Colorado. Look for the "What Can I Do?" sections on each page for resources on actions you can take to improve your air quality and reduce unnecessary idling. This website does not contain any information on idling trains because they are only regulated by the Federal government. Local governments do not have authority to regulate railroad carriers. This section covers over-the-road, long haul trucks, commercial diesel trucks, and local delivery trucks. Fuel wasted by idling is a major expense for the trucking industry. Colorado state law allows local governments to limit idling by some of these vehicles (commercial diesel trucks, 14,000 lbs or more) to no more than five minutes within one hour. This section covers public transit, school buses, and private coach buses. Buses idle while picking up passengers and to maintain comfortable cabin temperatures while stopped. Colorado state law allows local governments to limit idling by these vehicles (commercial diesel vehicles, 14,000 lbs or more) to no more than five minutes within one hour. This section covers taxis and limos. Car service drivers may idle a lot while waiting for and picking up passengers. This section covers personal passenger vehicles. Parents may be unaware of the negative air pollution emissions from their idling vehicles at student pick up times. The other type of vehicle that is associated with carrying students, school buses, is discussed in the Buses section. This section covers Convention Centers, Sporting Arenas, Hotels, Conference Halls, Performing Arts Centers, etc. Delivery vehicles, buses, and attendees' personal vehicles may be forced to idle if traffic patterns and parking logistics are not well planned. Colorado state law allows local governments to limit idling by some of these vehicles (commercial diesel trucks, 14,000 lbs or more) to no more than five minutes within one hour. This section covers government and private companies that operate a large number of vehicles with many different drivers. Anti-idling policies can help managers of large fleets, such as governments and long-haul trucking companies, to control fuel costs and maintain vehicle exhaust systems. This section covers local municipalities in Colorado who can adopt idling ordinances that regulate additional motor vehicles, such as cars, trucks, and motorcycles, within their jurisdictional limits. This section covers all drivers who can protect air quality and save fuel and money by remembering to turn their engines off when they stop.